I may know why I keep weird mental lists such as this in my head. I often find myself with the urge to replay games over and over and usually this isn’t because I want to re-experience a story, but instead re-experience its world. When I remember a game, specific areas usually flash through my mind. When I actually do replay many games, I usually realize those great areas were actually pretty few in number... but that doesn’t mean I can’t blog about those (cities to be specific). 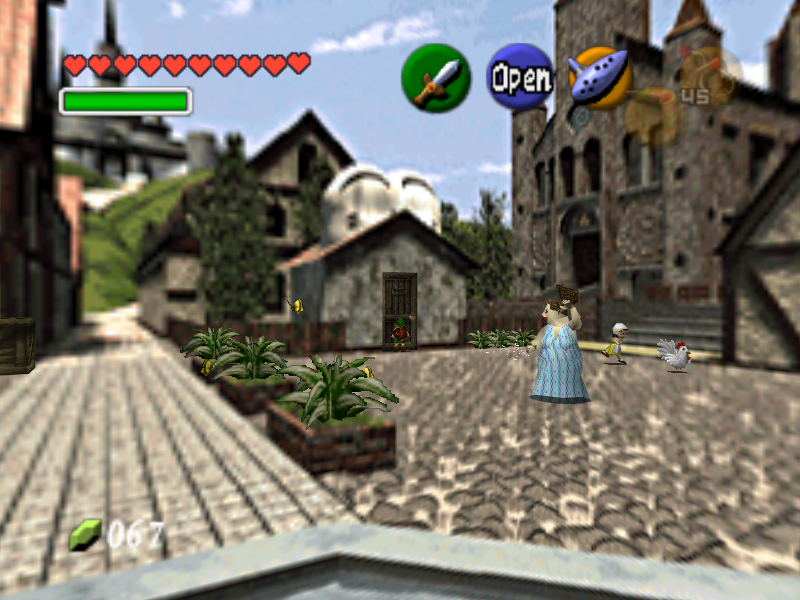 Zelda has some awesome towns, but Ocarina’s Castle Town takes the cake with the trifecta of having a massive bridge entrance, a bazaar, and hell, two versions (present and future). A ton of great minigames and night/day modes only add to make great variety of this town. Midgar is clearly an inspiration of Blade Runner’s Los Angeles: beautiful, futuristic glow above, filth and poverty below. Still, the Slums take on a life of its own. Specifically, the Wall Market area beams with character – from graffiti to mobsters to an adult-club. What’s more is the slum citizens all give off that weak and angry attitude of the poor (and it kinda of reminds me of my childhood). How can one go through the best towns in gaming without mentioning a zombie-infested one? Unlike the other towns in this list, Ravenholm’s purpose wasn’t to give the player a rest; it actually had the opposite effect. Ravenholm was chilling and frightful right until you left the area. Best of all, it felt like a place where people actually once existed. Is there something about Bazaar’s that are so appealing in towns? Nah. Much like Midgar, Rabanastre is memorable because the creators keep you in the city for so long. Unlike the former city though, you actually have reason to come back to Rabanastre with it surrounded in the other areas and contains the awesome Clan Centurio’s headquarters. The European architecture vibe doesn’t hurt either. Legend of Dragoon is one of my favorite games ever. I would say it even approaches the quality of FFVII. It’s a shame then that I rarely find the opportunity to even mention it on a blog. I was going to go with the interstitial community of Lohan, but it’s hard to top the classic medieval city that is Bale - complete with a massive castle and gorgeous artwork throughout. What I think I liked so much about this place was that it was a futuristic city that wasn’t so damn depressing. As much as I like those kind of places (Blade Runner again), playing games to immerse in a fantasy is ultimately what I’m there for. Note: there are many places like Silent Hill, Bioshock's Rapture, or Halo ODST’s New Mombasa that sound like they should be included, but these areas take up more or less the entire game so I don’t think they count.